Perch comes spiraled as shown in the picture. The diameter is the width of the cotton rope and the length is measured when the Perch is extended. 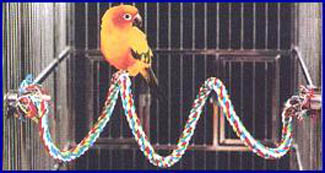 Offer Twister Perches for added stimulation in your bird's environment. Soothing and comfortable to sit on, these perches provide fun-filled exercise by creating loops, curves and interesting shapes inside or outside of your bird's cage. Twister (bungie) perches can offer limited movement because of the springy wire inserted within the tightly twisted cotton rope. Usually available in 3 or 4 sizes, Twister Perches are designed with the correct rope thickness and wire weight for each size bird.